They're really relaxed! My pigs all really DO work during cleaning. They're very helpful. They stand on whatever fabric I'm trying to remove, delightedly start chowing down on coroplast when it's exposed, and generally run under my hands as much as possible. It's great fun. Today I had just put down the new towels but not yet the fleece when I saw Snickers poop a HUGE poop. It almost looked like pre-neuter size. Huge and fresh. As I reached for it things went into slow motion, you know what I mean? and Snickers saw me reaching and turned and slow-mo started running RIGHT TOWARDS THE POOP and my hand was getting nearer but so was his paw and suddenly SQUISH and then POOPY PIG PAW PRINTS ALL OVER CLEAN TOWELS. Ha ha, yes, no one realizes the amount of work that goes into finding a comfy spot to sonnze in. Both girls are looking wonderful. LOVE Latte in the second "outdoor" shot!!! Alden, that image is stuck. Forever. I am lucky enough to have a two level cage. I lock them downstairs first and then put them up when I'm ready to do the bottom. It's all Latte can do to pull at the grid. She can't stand being confined to just one part of the cage. I had to put up a cloth so she would stop chewing the bars. I have noticed a large concentration of beans at the bottom of the ramp lately. For two weeks, I have vacuumed these beans from the spot right in front of the ramp while shaking my head and wondering why they would poop RIGHT THERE. Well, that is because they don't. Latte sits at the top of the ramp and poops over the edge and the beans roll down. I caught her doing it two days ago. She looks so effing proud of herself too. Those plans got derailed when the Princess decided that she was finished with her haircut. I got a palm sized pile of hair. Ok, ok. I chickened out. I just couldn't do it. What if her pretty hair didn't grow back as pretty? She realized this and smirked at me. You can just see it in the picture. Alice is a beautiful piggy. She's got her mum wrapped around her paws too. The trim looks like it went well. Well, we are off to the vet tomorrow. Someone left a few red spots in the cage right after I cleaned it yesterday. Couldn't figure out who it was. I set out some white towels this morning and caught the culprit. Miss Latte peed blood. To me, it seems a lot. She hasn't been acting different and this is the first I've seen of it. Hoping UTI but planning financially for a stone. This stuff always happens on the weekend. Jeez. Have you checked her ladybits? Did they look normal? They do look normal. When she pees, there is blood on the fleece and I've wiped it off of her bits. I think I've heard her cry while peeing once but dismissed it because Alice was near her and purring. Well, Ouiser stands as proof that strong lady pigs can pass stones and live on. Paws crossed! He is about 5 and is the sweetest boy around. He is kept in a tiny pet store cage with a layer of care fresh. He gets good hay (supplied by me from mysweet meadow stash) and, of course, the worst pellets out there. Hartz Bonanza. I decided to build a hotel for him out of the leftover grids I have. 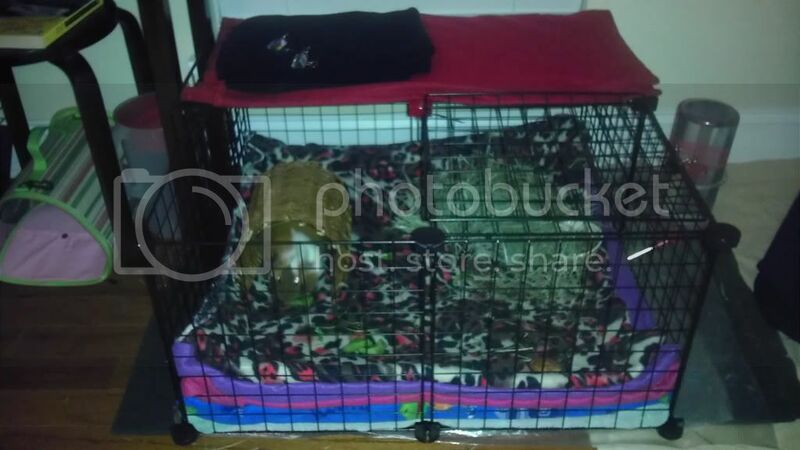 It is only a 2x2 with a cover but he has twice as much room as his pet store cage. I put the fleece in and set him in. He stood there for a second and then did a lap. He promptly dropped some Eau de Boar and popcorned. I stuck hay in and he dove in. Filled his dish with oxbow pellets and he ate. Then he popcorned. Piney then walked over to the side of the cage and stared at me for a minute, then he popcorned. I caught him doing zoomies this morning. He also wheeked for veggies. I caught him hiding behind his hay pile. I think he was afraid that someone might see him and take the big room away. Unfortunately, he goes back tomorrow, to my daughters friends house. At least, for a weekend, he knew the good life. It makes me very sad that he has to go back to a cage barely bigger than a 1x2. Oh, that makes me sad too! Could you lend them the cage for the summer? How about show them a video of what happiness means? Do they have room for a decent cage at the school? If so, I will donate the cage. Maybe your daughter and you can help build it so they can see how easy it is. I do think the video is a good idea. 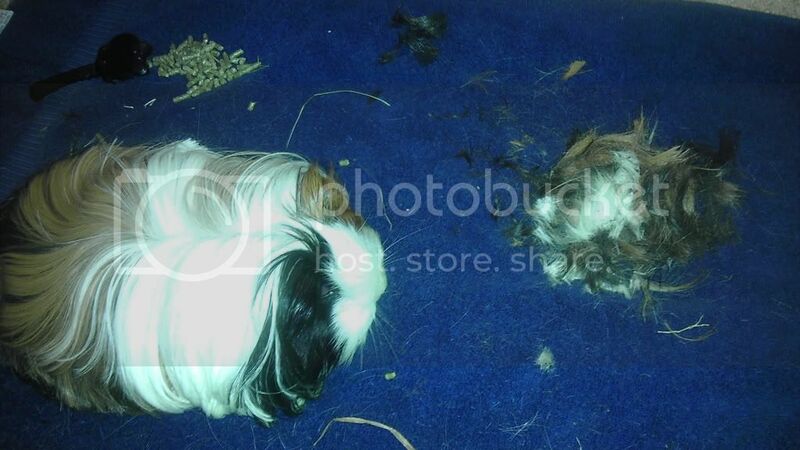 They probably don't know what a happy guinea looks like! Yes, they do and I would gladly donate mine. They won't listen. It's more work to them. 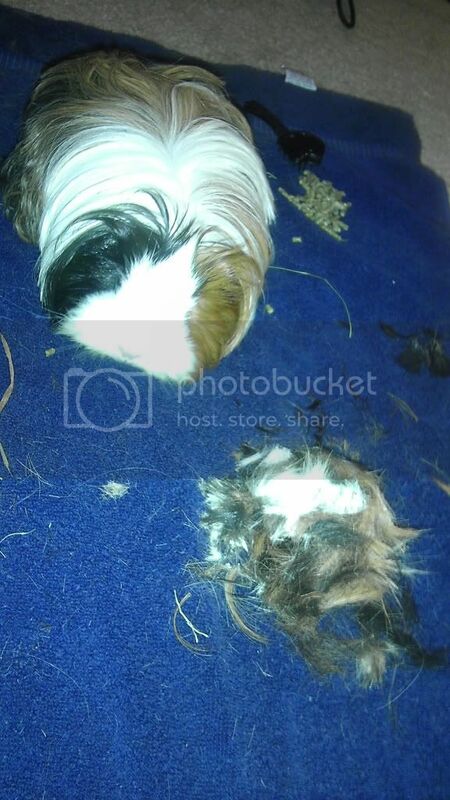 This is the pig whose nails I've been clipping and my daughter used to clean his cage during the school year. I'm going to give my friend the cage for the rest of the time she has him. I've got a full bag of Oxbow pellets that I'm going to send as well. Time to get ready for church. I'll ask forgiveness for the plot I'm seriously wanting to put in motion. More work?! It's LESS work! And twice the fun. If the girls will be in MS, who will take care of him? Poor fella. I wonder if just going to the teacher and asking for him to live out his days in a stressfree environment would be a good idea? He can be brought in for educational visits if they want? I have them for One more night. Friends got back a bit late and I told her to leave them til I get home from work. Then she and I can sit down and figure out what we can do. I'm not sure when he has to go back to the teacher. I think end of summer. If so, she can keep the setup I provided him for the weekend, until end of summer. If we can get the school to listen, he will have to stay at friends house. I don't have the means to take care of him if he gets sick, at this time. If she gets him, I'll still provide his hay and let her keep the cage. I'll even help with his pellets if she needs. She may be able to spay her female and let them live together. Val is only a year old as opposed to Piney being 5. I assume it would be better. If our financial situation changes, I may offer to help with the cost of the spay. He is such a good boy. He didn't seem unhappy but he didn't seem happy either. He has found his little wheeker and takes his baby carrot and runs around the cage. I'll keep an update going. If the school won't give him up then I will offer up his cage and an instruction on fleece care as well as what he needs each day. He went from getting sporadic veggies to twice a day at my house. Friend tries but she is still new to the whole concept of veggies and such. I'm working on that too. Or you could ...oops...trash the other cage so they HAVE to take this one! Pigs went home tonight. I took them and set up the cage for Piney. Once friend saw how happy he was, she said that she is just not going to take him back to the school at the end of the summer. If they call then she will tell them that she isn't going to let the old man be tortured by kids anymore. I'm going to do all I can to help her with his care. He was upset to be in the small cage while I transported him and rebuilt his cage. As soon as he got back in, he did a lap, popcorned and pancaked right in his hay. Happy ending. In the next week or so, friend is going to get cubes so I can build a cage for her girl pig. I once saw a school pig who lived crammed into a tiny cage with a rabbit--it haunts my conscience that I didn't do something.